To receive Unborn Word of the day by email, click here. 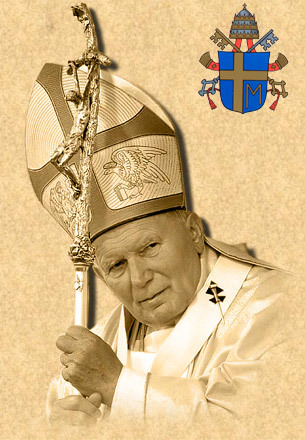 In 1999, at the age of 78, John Paul II wrote a fascinating letter. Fascinating, because as a senior citizen he wrote a Letter to the Elderly. He goes on to point out: “It has come to the point where euthanasia is increasingly put forward as a solution for difficult situations”. There are many inspiring words of wisdom and counsel in this letter to the elderly but what I found interesting is that he points out the many prominent Biblical figures who in the later years of their lives did great things for God. “The just will flourish like the palm-tree, and grow like a Lebanon cedar…, still bearing fruit when they are old, still full of sap, still green, to proclaim that the Lord is just” Psalm 92 (vv. 13, 15-16). John Paul lived this fruitfulness in his own life – for after this letter – even in his old age he continued strong writing one more Encyclical letter Ecclesia de Eucharistia (17 April 2003) and 12 Apostolic letters. He also proclaimed a Jubilee year (2000) and met with the Youth in Canada in 2002. He wrote numerous letters and preached the Angelus message regularly till March 20, 2005 just a couple of weeks before his death. In 2000 (Fatima, Jubilee Pilgrimage to the Holy Land, and the Jubilee Pilgrimage to Mount Sinai) – in 2001 Kazakhstan, Armenia, Ukraine, and the Jubilee Pilgrimage “in the footsteps of Saint Paul the Apostle”: Greece, Syria, Malta) – in 2002 (Poland, Toronto, Ciudad de Guatemala and Ciudad de México, Azerbaijan, Bulgaria and Ischia) -in 2003 (Pompei (Italy), Slovakia, Bosnia and Herzegovina, Croatia and Spain) – in 2004 (Loreto (Italy), Lourdes (France) and Bern (Switzerland) ). John Paul II certainly lived what he preached in this letter!